Thus, to be more than a fashion or a fictitious panacea, the concept of social enterprise needs to be debated. Southern realities cannot be only understood through imported categories and outside modeled guidelines. 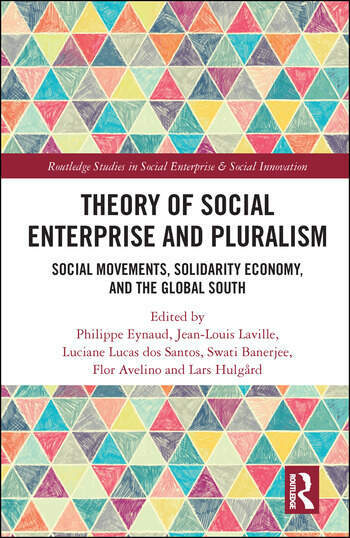 This book engages a multicontinental and pluridisciplinary discussion in order to provide a pluralist theory of social enterprise. The book will be of interest to researchers, academics, and students in the fields of social entrepreneurship, social innovation, development studies, management studies and social work. Philippe Eynaud is full professor at Sorbonne Business School, University Paris 1 Panthéon Sorbonne, and a researcher in Gregor. Jean-Louis Laville is a professor at the Conservatoire national des arts et métiers (Cnam, Paris) and head of the Chair of Solidarity Economy. Luciane Lucas dos Santos is a senior researcher at the Centre for Social Studies, University of Coimbra, integrating and co-coordinating the Research Group on Democracy, Citizenship and Law (DECIDe). Swati Banerjee, PhD is Professor and Chairperson at the Centre for Livelihoods and Social Innovation, School of Social Work, Tata Institute of Social Sciences (TISS), Mumbai, India and Co-ordinator, Right Livelihood College, RLC - TISS, one of the 9 RLC campuses across the globe. Lars Hulgård is full professor of social entrepreneurship, Roskilde University, Denmark and permanent visiting professor at Tata Institute of Social Sciences, Mumbai, India. Flor Avelino works at the Dutch Research Institute for Transitions (DRIFT, Erasmus University of Rotterdam, https://www.drift.eur.nl/) as assistant professor and senior researcher in the politics of sustainability transitions and social innovation.